The Mind of Mahatma Gandhi presents to the reader the quintessence of Gandhiji's thought and philosophy. The proofs of the original edition were submitted to Gandhiji in 1944, and were read by him. A committee which he had appointed to scrutinize the compilation expressed the opinion that it would constitute "a new Gita, a new Bible". 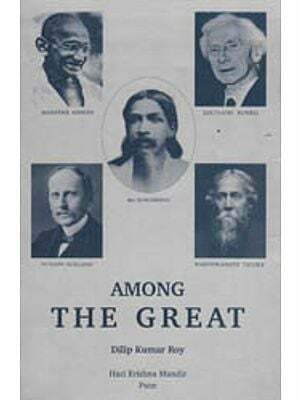 The book came out, with Gandhiji's approval, in March 1945. A second edition became necessary in October 1946. Reviewers and critics were unanimous in their appreciation of the book. It was included in all selective Gandhi bibliographies, and cited and quoted in numerous important books on Gandhiji since published. It has become an authoritative source-book. The UNESCO sponsored publication: All men are Brothers (1958) drew a substantial part of its material from The Mind of Mahatma Gandhi. Translations of the book have appeared in Indian languages Mahatmara Manoranga (1947 and 1952), in Kannada, by R. R. Diwaker; Gandhijinche Manas (1949), In Marathi by Annasaheb Sahasrabuddhe and Madhav Purshottam Limaye, and Manas-theertha (1958), in Konkani, by Ramchandra Narayan Nayak. The book has been out of print for the last six or seven years, during •which time Prabhu and Rao worked on bringing the text up-to-date. The revised and enlarged edition incorporates Gandhiji's thoughts during 1946-48, the crucial last years of his life and work. It is thus a faithful, authentic and comprehensive presentation of the mind of one who has been described as "the greatest Indian since Gautama the Buddha and the greatest man since Jesus Christ" and "as the greatest man of the 20th century". It gives me pleasure that a new, revised and enlarged edition of The Mind of Mahatma Gandhi, edited by Shri Prabhu and Shri Rao is being published by the Navajivan Trust. The first two editions of the book were very popular and its translations had appeared in several languages. In the new edition, Gandhiji's thoughts in the last few years of his life have been incorporated. Thus the book has been brought uptodate. "Who, indeed, can claim to know the mind of the Great?" is a famous saying of the Poet Bhavabhuti. Gandhiji was a great man; nevertheless, he had laid bare his mind in its fulness before the world. For his part, he had permitted no secrecy. Even so, I must confess, the last chapter of his life, which I have called the "Swarga-rohan Parva", or the chapter of the "Ascent to Heaven", remains a mystery to me. Indeed, in my eyes, it stands equal to the last phase of Lord Krishna's leela To unravel its mystery, it may become necessary for Gandhiji himself to be born again. Till then, I hope, this book will be an essential help for understanding Gandhiji's mind to those who are striving to establish Sarvodaya and are searching for Truth. To judge a great man or to decide his place in history, during his life-time, is not easy. Gandhiji had once observed: "Solon found it difficult to pronounce on a man's happiness during his life; how much more difficult it must be to adjudge on a man's greatness?" On another occasion, speaking of himself, he had said: "It will be time enough to pronounce a verdict upon my work after my eyes are closed, and this tabernacle is consigned to the flames." Nineteen years have now passed since he died-a martyr. His death was mourned by the entire world, surely as no other death in human history. Grief at his passing away was enhanced by the manner of it. As one observer put it, his assassination would be remembered for centuries to come. The Hearst Press of the United States believed that its emotional impact upon the world at the time had no parallel in human annals since the similar martyrdom of Lincoln. It could aptly be said also of Gandhiji that "he now belongs to the Ages". One recalls Jawaharlal Nehru's memorable words on that somber night: "Alight has gone out of our lives", d sentiment which the New York Times, on January 31, 1948, underscored, adding that it remained for the inexorable hand of history to write down the rest. What, then, will history's verdict be on Gandhiji? If contemporary opinion is to be regarded, Gandhiji would be placed side by side with the greatest men of human history. While E. M. Forster believed that he was likely to be considered the greatest man of our century, Arnold Toynbee is convinced that he certainly is. Dr. J. H. Holmes offered a more concrete estimate when he described Gandhiji as "the greatest Indian since Gautama the Buddha and the greatest man since Jesus Christ". In the hearts of his people, however, he is likely to be enshrined as the Mahatma, or, more endearingly, as Bapu-the 'Father of the Nation' who led it to freedom-through a bloodless revolution. What attributes in Gandhiji constituted the fibre of greatness? He was not merely a great man; rather, he was both a great and a good man-a combination which, as a critic put it-is too rarely achieved and too little appreciated. One recalls George Bernard Shaw's laconic comment: "It is dangerous to be too good." History will also record that this little man •held tremendous-almost unparalleled-sway over the minds of his fellow men. Strangely, for that command was backed by no sanctions of temporal power or the might of arms. The clue to this enigma, if enigma it was, lay in Gandhiji's personal character and example, according to Lord Halifax who, as Viceroy during the days of Gandhiji's Salt Satyagraha, came very close to understanding him. It was that strength of character and of practice, as distinguished from precept, that enabled Gandhiji to influence so deeply the thought of his generation. Indeed, Prof. L. W. Grensted holds that Gandhiji's greatness lay not in his achievement, but in his character. To this Philip Noel-Baker would add purity of motive and self- less devotion to the cause in which he believed. But this, surely, is not all the reason for Gandhiji's unprecedented ascendancy. Reginald Sorensen, to cite again contemporary testimony, believed that if Gandhiji exercised an influence beyond calculation not only in India but upon our modern age, it was because he bore witness to the power of the spirit and sought to implement it in his political activities. 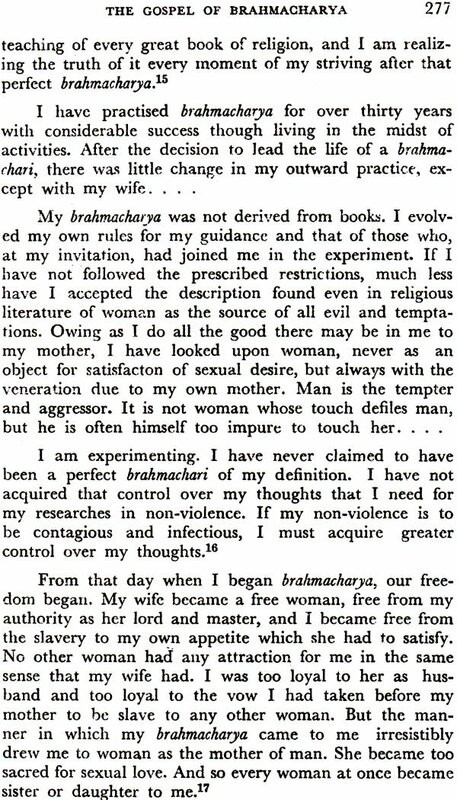 Here, then, in his re- affirmation of faith in the human spirit as well as in his introduction of spiritual values and techniques in mundane matters lies the uniqueness of Gandhiji. It is in this con- text that Dr. Francis Neilson says of Gandhiji: "A Diogenes in action, a St. Francis in humility, a Socrates in wisdom, he reveals to the world the utter paltriness of the methods of the statesman who relies upon force to gain his end. In this contest, spiritual integrity triumphs over the physical opposition of the forces of the State." Gandhiji had pitted against the organized might of the State the pure strength of Non-Violence and Truth. And he had won. But the gospel of Non-violence and Truth which he had preached and practised was no new philosophy. He had indeed admitted, nay even claimed, that it was "as old as the hills". Only, he had resurrected that philosophy and used it on a new plane. In conformity with his belief that Truth, as a living principle, has growth and as such, is bound to reveal to any earnest votary of it, newer and newer facets of it, he claimed to have discovered new dimensions and new potencies in the principle of Non-violence. True, that principle was only the obverse of that of Truth; but, for that very reason, inseparable from it. Gandhiji had made it his life-mission to bring home to his fellow men all over the world the conviction that there is no salvation for them, whether as individuals, communities or nations, unless they tread the path of Non- violence and Truth. That path in politics implied-and implies-what one critic put as a revolution much more radical than any other, because it meant that we must change the whole order of personal or political life, or change nothing. But, for Gandhiji there was or could be no wall of separation between the personal and the public, the inner and the outer life of man. In this respect he stood clearly apart from and above most of the world's politicians and states- men. And therein lay the secret of his strength. Gandhiji has himself observed that whatever power, whatever influence he had possessed or exercised had been derived from religion. Stafford Cripps had perhaps this fact in mind when he remarked that there has been no greater spiritual leader in the world of our time. Manchester Guardian, on January 31, 1948, summed up this aspect of Gandhiji's personality when it wrote; "He is, above all, the man who revived and refreshed our sense of the meaning and value of religion. Though he had not the all- comprehending intellect or the emotional riches which can construct a new philosophy or a new religion, yet the strength and purity of his moral urge were clearly derived from deep religious feelings." The world today admittedly stands on the verge of disaster that may well be irretrievable. The reason: the constant ideological conflict, the fierce race hatreds that may lead to wars more terrible than any in history, and the ever-present threat of nuclear proliferation, involving the possibility of unimaginable destruction. Thus situated, mankind has to make its choice-for its sheer survival-between the moral and the material forces. The latter are leading humanity headlong on the road to self-annihilation. Gandhiji shows the other road, because he represents the moral forces. Maybe, it is no new road. But it is the road which the world has either forgotten so long or has not had the courage to take, and which it can now ignore only at the cost of its very existence. Here in this book of his own words, the Mahatma speaks, and speaks for himself, with no interpreter between him and the reader, for none is necessary. Western people have sometimes expressed difficulty in understanding him. Note, for instance, Horace Alexander's statement that, in some ways, Gandhiji's deep metaphysical reasonings could be very baffling to the Anglo-Saxon mind. This volume offers basic material for understanding Gandhiji's mind on matters moral, social, political and spiritual. The advanced student of psychology, however, may need to probe deeper into the fundamental origins and sources of Gandhiji's motivation and conduct. To him this work can only be a source of reference. The present revised and enlarged edition appears over twenty years after the earlier ones. It incorporates what they could not: the thought and philosophy of Gandhiji's crucial final years: 1946-48, when he rose to the transcendental heights of the human spirit-above caste, creed, party, and even country. Then he belonged, more truly than ever, to all humanity. For, in those years which led him inevitably to the supreme denouement of martyrdom in defence of his faith, he preached and practised the religion of humanity, the religion by which alone mankind can survive. And it is because of this that the views and opinions which he had expressed in those last years assume for us and posterity a sanctity and a valedictory finality which make them indispensable to the comprehension of the totality of his mind. Their assimilation in the present volume has involved the introduction of some new chapters and the enlargement of several of the old ones. Again, the earlier editions suffered somewhat from the exclusion largely, if not wholly, of most of his thoughts on problems of purely Indian interest. This was done on grounds both of limitations of space and the needs of the wider readership abroad. The defect needed to be remedied if the personality and vision of Gandhiji had to be understood in their fulness. In his eyes, India had a mission for the world, and he had wanted her to be at once the example and the exponent of his philosophy. This India of his dreams is now presented in an almost entirely new section: "Freedom and Democracy". There has also been a noticeable re-organization and re-arrangement of the material which is calculated to fulfil better the aim and purpose of the book. The compilers' grateful acknowledgments are due and are here made to the publishers of all the books, periodicals etc., from which the material has had to be drawn in the preparation of this volume. The compilers are deeply grateful to Acharya Vinoba Bhave for writing a foreword of great significance to the new edition. It remains only to add a personal note. This preface appears, it will be seen, under the initials of only one of the compilers. For, the other is no more. R. K. Prabu, life-long student and faithful exponent of Gandhiji's teachings, friend, philosopher and guide to many including his collaborator, passed away on January 4. This was before the preface to the new edition could be drawn up and the book itself published. For much of what has been written here, therefore, the responsibility is that of the surviving compiler; likewise, the blame for that which ought to have been said, but is not. Yet, both responsibility and blame stand somewhat mitigated in that the present writer had recourse to the random jottings and lucubrations, as Prabhu called them, conveyed in his letters almost to the last day. For thirty years the present writer has been privileged to enjoy Prabhu's friendship and, for quite some of them, active collaboration with him. No tribute that he can pay, therefore, may be adequate in his own eyes: for a similar reason, none that he pays may appear wholly impartial in those of the readers. Prabhu was the originator of the "grand" Gandhi project which was to encompass this and several other volumes of Gandhiji's thought and philosphy. Only three, however, could materialize from the joint labours. Fortunately, Prabhu by himself produced several others big and small, all published by Navajivan. It is for the serious student of Gandhian literature to evaluate Prabhu's contribution to it. His collaborator must content himself with acknowledging his debt to one who gave him his inspiration, initiation and association. Two very special and unsolicited observations as to Prabhu's place in the field of Gandhi compilations may, however, be cited here. One, Gandhiji's own, made to the compilers during a memorable interview on June 27, 1944, at the Nature Cure Clinic in Poona: "You are saturated with the spirit of my writings." The other by a notable philosopher-interpreter of Gandhiji: Dr. Sarvepalli Radhakrishnan who, in a personal message of condolence on Prabhu's death, wrote: "The publication of his work on Gandhiji will be a good reminder to us all of his main life-interest."